The shoes on the porch, the bicycle by the steps and the tree obscuring the view. Somehow they all seem to contrive to make the facade look even more attractive. May be it is the signs of life. 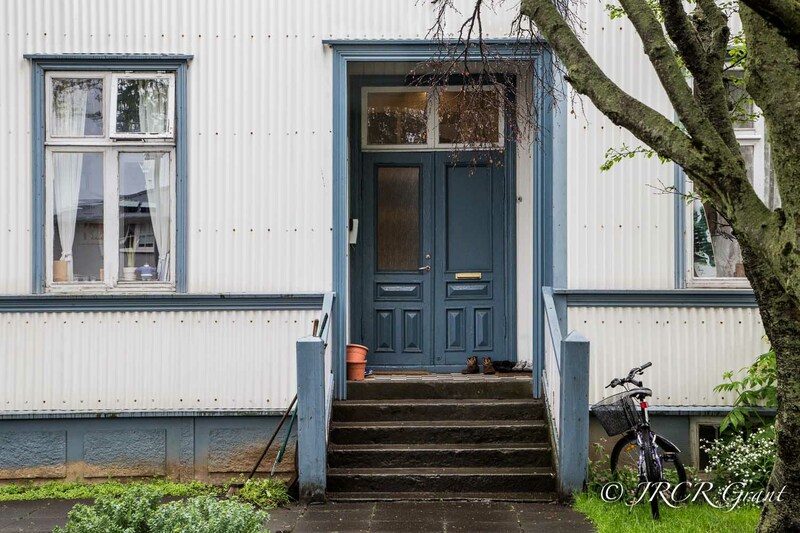 Needless to say, this image was taken on yet another wet day in Reykjavik…. The items in the window. I like it!! Another one of those trees coming in from the right…great shot! Great picture and I love those wooden doors with the fan-light windows above. Lovely, authentic atmosphere! Fine capture, MM. The shoes in particular make me see this as an image of a home rather than of just the front of a house.